The Showalter team at Orlando Executive Airport gave us a wonderful send off. Banners and caulk art and lots of best wishes from the crowd. Even Kevin McNamara the ORL Airport Manager was on hand to wave us off. Bob was the first leg pilot and I (Mercer) was honored to be the co-pilot on the first leg from Orlando to Bangor. I would like to say Bob could not have done it without me but that would be a slight exaggeration. I basically kept the seat warm and watched Bob fly this spectacular Citation CJ3. Bob got a 10 on his perfect landing in Bangor setting the tone for the rest of the 16 landings. The competition will be tough! With Chris as Pilot and Bob co-pilot, the second leg went perfectly. 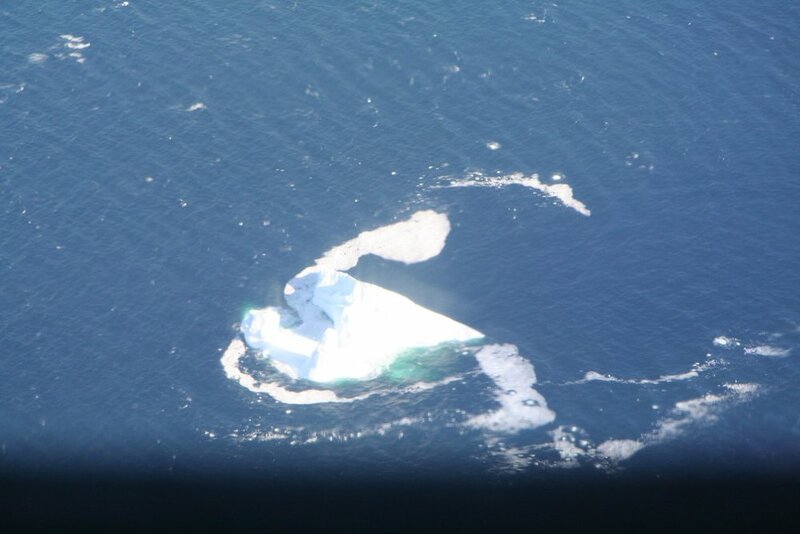 On the approach to St. John’s Newfoundland we saw several icebergs, frozen lakes and snow. This is a very cold place. The glaciers of ice ages past gouged out the rock making the land look like tree bark ravaged by a bear’s claw. The final approach was perfectly shot to minimums 200 feet by the experts in the front office. We were greeted by very friendly FBO personnel in St. John’s who helped in every way possible. Damn, this place is cold! Only 32F but windy and damp. Slight problem on entry with no pre-notification of Canadian Customs. But the Customs agents were great and we served no jail time. They asked if we were carrying more than $10,000 cash. We said no, we were married. Off to the Fairmont Hotel for dinner and sleep. The best scallops ever in the restaurant at the Fairmont. The Scotch and local beer was also pretty good. Damn this place is cold and bleak! Chris thinks the locals don’t know that they can leave. Chris also allowed that if he lived here he would be looking for a rope and a shower rod. Bleak and cold but the people were very friendly. I have an iceberg outside my hotel window. Damn this place is cold! Jim in command and Chris co-pilot. We launched pretty heavy (legal of course) and Jim lifts off beautifully. This airplane is amazing I do not think we used 2,500 feet of the 11,000 foot runway. Jim gracefully pulls up into the 200 foot overcast into a 40 knot head wind. Bob blames this head wind on Earl. Bob asked Earl to turn around; no help. We are supposed to have a nice tail wind. Not good when we have a long ride to Iceland. I think it is Jim’s fault; more justification for his global warming theory. I note that my son-in-law’s (Kelly Parker) parents in South just got a late 23” snow. Who knows? From Flight Level 450 so long for now.